The collection taken at the Watchnight Service totalled £202, which will be divided between The Aberlour Trust and Samaritans. Bennochy Rainbows, Brownies & Guides are holding their annual fundraiser & concert for parents, family & friends on Wednesday 9th December starting at 6pm. Tea & coffee will be available along with some stalls. All welcome. The total raised to date at last Saturday’s afternoon teas is £1,124.96. A very big thank you to all who helped in any way to make this a successful event. Messy Christmas @ Bennochy Church will be held on Sunday 6th December from 3.30pm - 5.30pm. Come and join us and get messy with glitter and paint, as we make Christmas themed crafts, a large stable and share a Christmas meal. Everyone welcome, although children must be accompanied by an adult. For more information contact Louisa Turner, Development Worker - 01383 729526. The Service on Sunday 6th December is our Gift Service to support the work of the Salvation Army in Kirkcaldy. Please bring a gift or a toy for a child, preferably for a baby or a child over 9 years old. All gifts must be new and unwrapped and will be distributed locally by the Salvation Army to the needy in the district. No clothes please. The Flower List for 2016 is now available in the vestibule of the Church. Please put your name against the Sundays you wish to provide flowers for the Sanctuary. If you wish to have a poinsettia(s) in the Church for a friend or in memory of a loved one, please put your name on the Poinsettia List in the vestibule by Sunday 6 December. These plants will decorate the Church on Sundays 13 and 20 December. After the Service on Sunday 20 December you can take the plants home. The cost of a plant will be £6. Payment should be made to Senga Booth. The Church of Scotland is taking a long - term approach to tackling inequality and injustice. Over the next ten years, it will bring about change in some of the most critical issues facing our nation and planet. It wants the people of Scotland to help to set these priorities. This autumn the Church and Society Council is asking people in local churches and in every part of Scottish society - politicians, voluntary organisations, people from every walk of life, including those who are the most disadvantaged and excluded in Scottish society - to help us develop new ideas and priorities to work on in the future. We want to hear from 10,000 people about what will make the biggest difference. It is 2035. Scotland is a fairer, more equal and more just society in a fairer, more equal and more just world. Take your time and imagine what this would look and feel like. We will gather everyone's suggestions and identify no more than 6 key areas for action. We will then commit ourselves to work every day to bring these changes about – locally, nationally and internationally - in every part of Scotland, for at least the next ten years. On Sunday 22nd November the congregation will be invited to complete postcards from the Church and Society Council, asking people to identify one key issue for the Council to address, to help them develop their long term priorities. The Walkers next walk is on Sunday 8th November leaving from the Church at 12.45pm. This time we travel to Cupar for a walk around the area. The November edition of the Church of Scotland Crossreach Information Sheet can be read by clicking here. Our next Messy Church at Bennochy will be on Sunday 1st November from 3.30 – 5.30 pm. Everyone is welcome to come along with your family to enjoy an afternoon of fun, games, activities, crafts, Celebration and a meal. The Messy Church team need the help of the congregation... to greet our families we would like to offer refreshments including home - baking. As a team we would be very grateful for any contributions of home - baking next Sunday. This month we will be thinking about ‘The Lost Sheep’ and we need to borrow soft toy lambs or sheep - we need as many as possible for an activity. (please attach a label for safe return), If you can donate or lend please pass them on to a Messy team member or hand them to myself on a Thursday at the Olive Branch Café. Thank you. If you can’t make November’s Messy Church, the next one is on Sunday 6th December when we shall be getting messy with glitter and thinking of Christmas. Louisa Turner, Bennochy Parish Church, Development Worker. It is not difficult to choose gifts for people who have so little. Things we take for granted can often be luxuries for people living in desperate poverty. By filling a shoe box with simple gifts you can bring joy and laughter to someone at Christmas. Covered shoe boxes are available in the vestibule so if you wish to fill one then please take your box today. The boxes are being uplifted on Thursday, 12th November so please bring your filled box to church on Sunday 8th November or if that is not suitable then bring your box on a Sunday nearest to that date. Thank you. Update: Thank you very much to everyone who filled a shoe box or gave a donation. Also a big thank you to all who helped in any way with the appeal from covering shoe boxes to loading the lorry. Your help was much appreciated and made everything so much easier. 104 boxes were filled by the congregation and 51 by pupils of Dunnikier School. After a short service at Templehall Church the boxes are now being checked in a warehouse before being loaded into containers - one container holds 7,500 boxes, before going on their journey to different Eastern European countries. I hope you enjoyed filling them as much as the recipients will enjoy opening them. This was a wonderful result to the appeal and thank you again for being part of it. You will bring a smile to someone at Christmas who would otherwise receive nothing. Our annual Gift Day is on Sunday 18th October during the Sunday service where you are invited to donate to the work of our Church. If you are a tax payer, please mark any donation as Gift Aid as we can claim back approx. 25p in every pound you donate (no strings attached). The October edition of the Church of Scotland Crossreach Information Sheet can be read by clicking here. The Olive Branch volunteers are going to be making apple and ale chutney soon to use over the winter in the café. If anyone has extra fruit from apple trees in their gardens, would you kindly let the Open Door Team know – we can collect before 7th October. Thank you. Alison , Christine, Phil, Graham and Dianne. The September 2015 newsletter is now available from our missionary partner Jenny Featherstone in Zambia. Robin has recently returned from Zambia where he visited our missionary partner Jenny Featherstone as part of his study leave and has prepared a report on his visit. The Walkers next walk is on Sunday 11th October leaving from the Church at 12.45pm. This time we travel to Devilla Forest near Kincardine and walk for approx. 5 miles on good flat paths. Refreshments at the Walled Garden nearby. Messy Church is a way of being church for families; involving fun that helps people encounter Jesus as Lord and Saviour. Messy Church is found across the world with shared values of being Christ-centred, for all ages, based on creativity, hospitality and celebration. Jam jars with lids; masking tape; pva glue; post-its; paper/card; paints; pens; cotton wool; baby wipes; kitchen roll; craft items; pipe cleaners; items for a sea/underwater collage; old wall paper rolls (for drawing on); bin liners; games and toys (for all ages large and small); bubbles; 2 man tent; children’s tent; mixture of balls; and a mixture of sports equipment. If you can donate any of these things or any other donations (permanently or just as one offs) it would be much appreciated and gladly received, please hand them to a member of the team or contact myself. If you would like to come and be part of the team on the day please contact Louisa Turner, our new Development Worker. Our next event is following the Harvest service when we will be hosting Messy Church from 3.30 pm – 5.30 pm. Our annual Fun and Find Out Day will be held from 2pm to 4pm on Saturday 26th September. This is an opportunity for all to hear the Community Choir, take part in quilting, have a go at hand–bells, find out about Fife Carers and Greener Scotland, have your face painted and watch Magic Jim, plus much more including refreshments and hot dogs. 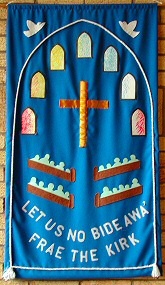 The events will be held in the church grounds and halls. Our Kirkcaldy Foodbank advisor, Iain Anderson, recently visited Dundee-based charity “Transform Community” who administer the FareShare franchise for Tayside and Fife. Kirkcaldy Foodbank buys food from FareShare at very low cost, which makes your donations go further. Find out more about FareShare at Fareshare Tayside and Fife. The picture shows Craig (volunteer), Chris (warehouse manager) and Simon (C.E.) at FareShare. Our Harvest service will be celebrated on Sunday 27th September. Please bring your gifts of non perishable food stuffs to support the work of the Salvation Army in Kirkcaldy. There will also be an offering taken to support the work of our Mission Partner in Zambia. The Church will be decorated on Friday 25th September at 2.30pm. Anyone willing to assist is welcome to come along at 2.30pm. Also help is required immediately after the Service on Sunday 27th September to assist with the packing of the produce for the Salvation Army. Update from the Kirkcaldy Foodbank: The Foodbank volunteers have been overwhelmed by the generosity and thoughtfulness of all the churches and schools who decided to give some (or all) of their donated non-perishable goods to help increase the foodbank stocks which in turn goes to help those desperate families in need in our area. Please pass on our and their thanks to all involved and accept our sincere thanks for the very generous donations made during your recent harvest festival. Sing Up! A new, inclusive, informal and inspiring COMMUNITY CHOIR starts up in BENNOCHY CHURCH on Wednesday 2nd September 6.30pm – 8.00pm. No auditions – all are welcome. Come, join us and make your voice heard in your Community. Contact Dianne on 07980 367632 for more info. The September edition of the Church of Scotland Crossreach Information Sheet can be read by clicking here. A workshop is planned to train volunteers in helping our Advent celebrations. This day’s training will prepare those participating to teach their congregation a signed version of the song ‘Advent Ring’ (CH4 282). The aim is to challenge each congregation to learn a new verse in British Sign Language (BSL) each week in the run up to Christmas. Everyone is welcome, and there is no previous knowledge necessary. Work on the new store is complete. A new hard wearing carpet is to be laid in the store section opposite the kitchen on Monday 31st Aug. The heating installation will be finished on Wednesday 26th, after which contract cleaners will move in and clean all the halls, kitchen and toilets. This work will be done on Thursday and Friday 27th/28th. Fitting Storage Racks and other facilities will an ongoing factor for some time. A working squad is required on Monday morning (24th August) to assist with throwing out items that are lying in the Methven Hall. It is essential that this is done so that the cleaners can do their job. Let’s say 9.00am for about 30 mins. This is a unisex operation but be aware some of the items to be thrown out are covered in builders dust. We have a new quilting group in Bennochy. The group is to have a ‘stall’ at the Fun and Find Out Day on September 26th when the ladies hope to encourage members of our community to sew some materials together and create a quilted cushion cover. The group has no resources at all yet, and so they are appealing to the congregation for donations of materials you might have at home that could be put to good use. The materials can be any colour or pattern but must be 100% cotton. Please pass any donations to Mary Stark, Margaret Docherty, Rona Traill or to any of the Open Door Team. Thank you. Why not take a look and raise funds for the Open Door Team! The Walkers next walk is on Sunday 16th August leaving from the Church at 12.45pm. This time we travel to Rumblingwell, Dunfermline and walk to Cairneyhill for 5 miles. It's a nice, relatively flat walk suitable for all and follows the old rail bed, now a cycle route and then finishing with a fairly quiet road walk. It will involve a bus return to Dunfermline, for those who pay, £2. Coffee is possibly Fairleys Garden Centre in Cairneyhill but we can decide that on the day. Robin is on study leave visiting our missionary partner Jenny Featherstone and will be away from Bennochy from 3rd to 31st August. Local ministers will cover for funerals and our Session Clerk, George Drummond, will be the first point of contact for all other matters. Please contact him on 200179. The Walkers next walk is on Sunday 26th July leaving from the Church at 12.45pm. We’ll drive to Markinch station and walk to Leslie, although two cars will need to go to Leslie at the start and leave one car (mine) there to transfer drivers for the return journey. Buses from Leslie on a Sunday are infrequent. Refreshments aren’t planned yet – hoping to get Trinity Church to provide our usual fare. Approx. 5 miles, easy, flat walking. Members of the congregation have been kept informed of the proposed changes to the building about to take place. Major works will begin on Monday July 6th – replacing the central heating boilers and many of the radiators within the building and building a new store within the Methven Hall. Please note that for reasons of your health and safety there will be no access to the halls and sanctuary from Monday 6th July for the rest of July since all areas will become a building site. There will be restrictions during week-days in August also. The Church will be available for worship on all Sundays in August. Access to the toilets will be possible but the Methven Hall and the St Andrew’s Hall will still be working sites and are likely to be out of use for the whole of August. You will realise, therefore, that there will be no teas after the services during August. If you have items in the church or halls which you may need during the summer please remove them before the work begins. We look forward to the successful completion of these improvements. The installation of the new heating system has resulted in the temporary electrical heaters in the St Andrew's Hall and Ladies Toilet/ Meldrum Room becoming redundant. They are still under warranty having been used for less than 6 months. All heaters are still in situ and can be viewed in these spaces. The Wall mounted heaters in the St Andrew's Hall are suitable for floor mounting. All brackets and fittings are still available. Costing £140.00 when purchased the church are will sell for £100.00. The tubular heaters in the Ladies Toilet and Meldrum Room come with suitable guards and are a complete package. Costing £51.00 when purchased the church will sell for £30.00. Interested - see Ian Maxwell for sales. The Walkers next walk is on Sunday 5th July leaving from the Church at 12.45pm. This time we travel to Falkland and then by bus at 1.30 p.m. to our starting point. Remember the bus pass!! A canny dander partly through woods, in lovely countryside, mostly level and good under foot. Refreshments on completion. Come and join us . Contact Christine/Charlie Low on 01592 262989. The June 2015 newsletter is now available from our missionary partner Jenny Featherstone in Zambia. Please join us as the town centre churches come together for worship and fellowship this summer. Note that Bennochy Church is closed on the Sundays where the joint service is held elsewhere. The June edition of the Church of Scotland Crossreach Information Sheet can be read by clicking here. Anyone interested in joining our new Community Choir, soon to start up in Bennochy Church, please come along to the taster session on Wednesday 10th June from 6.30 – 8.00 p.m. or speak to Dianne (07980 367632). No auditions. All welcome. The installation of the new system will start on Monday 6th July. Before that date we have some work and clearing out to do. The biggest job will be to clear out the current Boiler House which has been used as store space for some time. Years and years of accumulation will have to be moved in one forenoon and for this I need a squad of helpers. The work will not be difficult or hard - all it will be is walking from the Boiler House to a skip sitting at the Car Park gate in Meldrum Road carrying a brick or some other object. This is a unisex operation which is open to all church members. The more who turn up the quicker the job will be done. The date is 15th June at 9am. The Walkers next walk is on Sunday 7th June leaving from the Church at 12.45pm. This time we visit Letham Glen and Silverburn and we will be led by Janet and Carol. This is a lovely walk and takes in park, countryside, golf course, beach and town. All are welcome . We have had a splendid response to our Christian Aid Week efforts and raised ££3187.73 in the door to door collection, £421.57 from the Soup and Sweet Lunch and £412.22 from the collection during the Service on Sunday, 10th May. Added to this is the tax recoverable value on Gift Aid which realises £218.50. A fantastic total of £4240.02. Thank you most sincerely to everyone who donated in any shape or form and to our members who distributed and collected envelopes, a job well done. Christian Aid is in its 70th year and it is just as important today, if not even more so, than when it first began, that we continue to give support to those in need at both home and abroad, irrespective of colour, culture or creed..
Our next Messy Church takes place on the morning of Saturday 6th June. Messy Church is for families (children and adults), is fun involving creativity (crafts and getting messy! ), celebrates (a time of informal worship) and offers hospitality (a shared meal together). We very much hope you will be able to come along and support this new initiative. There are no age restrictions - young or old! I anticipate, if these pilots are successful, that our Messy Church would continue every 4-6 weeks, throughout the year, beginning September/ October 2015. If you can't make this date, but are interested in being part of Messy church in the future, please let Robin know. The May edition of the Church of Scotland Crossreach Presbytery Information Sheet can be read by clicking here. There will be a concert held in the Church on Saturday, 16 May at 7:30. Carpe Diem is made up of Players and Singers from Fife, Perth and Edinburgh who regularly take part in the Edinburgh Fringe and have performed in other churches and venues in Fife. Some members from the group are coming to perform a mixture of Scottish Songs and Tunes and some favourites from various Musicals for us. Tickets priced £8 (includes a glass of wine or soft drink) are available from Margaret Kinnear, Diane White or Senga Booth. Proceeds from this Concert will be divided between Kirkcaldy RNLI Branch and Bennochy Parish Church. Our annual bereavement service will take place on Sunday 10th May at 3pm in the Church, inviting all family and friends connected with Bennochy Church, our parish or whose funeral has been conducted by our minister over the past year. All members of the congregation are welcome to attend. For details please contact Robin. The Walkers next walk is on Sunday 19th April leaving from the Church at 12.45pm. After parking at the Queensferry Lodge Hotel, we will walk to South Queensferry, with refreshments at the rail bridge Bistro. There and back is 4.5 miles. The ladies of the Womens Group invite you to their Bunny Drive on Tuesday 14th April at 6.30 pm. Tickets - adults £4 and children £2 - available from Group members. Come along and enjoy an evening of fun and excitement for all ages with light supper, prizes and raffle. Update: The sum of £278,67 was raised. Many thanks from the group. The Walkers next walk is on Sunday 29th March leaving from the Church at 12.45pm. This walk is from Kirkcaldy to Kinghorn and return. This is a part of the Fife Coastal Path and is a walk we've previously done. Walking poles may be needed but binoculars would also be good on this walk as there is lots of wildlife to be seen. Coffee stop will be at the Carousel, Kinghorn which offers great views and nice facilities. All are welcome. The March newsletter is now available. You can read all the latest news by clicking here. Other Easter morning services are - 6.20am in Linktown Church garden followed by breakfast in the church hall, then St. Bryce & Abbotshall service at the Beveridge Park fountain at 8.30am. All are welcome to both services. Our Easter Service will be held on Sunday 5th April and includes Communion. Jenny is in a dilemma regarding funding for courses this year. It's nothing new to go through various crises, but the source of income support from CHAZ (Churches Health Association of Zambia) has now stopped. This organisation has disbanded. This means that 8 carpentry students, also 3 tailoring students, may not continue their courses, unless other sources of income are found, so, our Zambia boxes will be out for the month of March if people wish to make a donation. We will also uplift an offering during our March Communion service on 22nd March. The Zambia boxes are located in the vestibule and in the large hall. Update: A total of £650 was raised during the month, including at the Primary School Easter Services. This year's service has been compiled by the Christian women of the Bahamas and will be held on Friday 6th March. A warm welcome awaits you at your local services:- The Salvation Army Hall, High Street/Hill Street at 2pm, and also in Dysart/St Clair Church at 7pm. The Open Door Team is organising an Auction on 28th March in aid of church funds. We are appealing to the congregation for items which you may have at home that you would be happy to donate for auction. Ideally, the items would attract bids of at least £10. eg - Jewellery, collectables, vintage/antique ephemera, small piece of furniture, sport/music/memorabilia, or simply new goods for which you have no use. Please speak to any member of the Open Door Team – Alison, Christine, Phil, Graham or Dianne who will be happy to accept your donation or collect it from your home. You can also send a message via the Contact Page. Thank you. Update: A total of £1700 was raised during the evening. Senga Booth, again with lots of help from friends from Bennochy Church, is holding a Tea Afternoon - Sponges and Scones in the Methven Hall from 2 till 4pm on Friday 6 March for the RNLI SOS Day. Please come along and sample our scones and sponges (SOS). We will be delighted to see you. There will also be a Cake and Candy Stall. Tickets are available from Senga. All proceeds will go to the Kirkcaldy Branch of the RNLI. Tea tickets are £3. Update: The sum of £1,365 was raised on 6th March at the SOS Day. On behalf of the Kirkcaldy Branch of the RNLI, I would like to thank everyone who supported us in any way to raise this fantastic amount. I would also like to thank Bennochy Church for the wonderful support given to us every year, helping us to raise money for lifeboats and crews who do such a great job around our coasts, often in very dangerous conditions. Senga Booth, Treasurer, Kirkcaldy Branch of the RNLI. The Walkers next walk is on Sunday 1st March leaving from the Church at 12.30pm. We’ll park up at Newmills and do a circular walk through Valleyfield Woods snowdrop trail. This is not a flat walk, will likely be glaury at parts and there is a stretch of a mile or so of road walking, so wear high viz clothing if you have any. Refreshments at the lovely Sundial Café in Limekilns. All are welcome. The Fairtrade movement has generated significant economic benefits for farmers and workers around the world. Please give your support by purchasing Fairtrade goods in your local shops. Thank you. The dates are from 23rd February - 8th March. The Stated Annual Meeting will be held after the Church service on Sunday 8th March. All are welcome to attend. At the meeting the 2014 accounts will be presented to the Congregation. We are also pleased to advise the Congregation that Margaret Kinnear has kindly offered to take on the role as Church Treasurer and will work with our Finance Team, taking over from Brian Booth who has performed this role for many years. A special News Sheet has been produced to inform members of some important changes and developments taking place within our church. You can read the News Sheet by clicking here. General Assembly of the Church of Scotland - can you help? The Walkers next walk is on Sunday 8th February leaving from the Church at 12.30pm. The walk is from Cardenden to Kirkcaldy via Dundonald Den. It’s a great walk though a bit glaury at parts. Approx 4.5 miles. The recce took 1 hr 40 mins. We need to drive up to the car park at Frankie and Benny’s in time to catch the 12.43 bus across the road at Chapel Level. Must catch this as there is only one bus per hour. Remember to bring your bus passes! £2.10 fare for the young folk. Refreshments at The Dean Park Hotel. New walkers always welcome. Every Monday in the Methven Hall from 6pm-7pm we now host a Zumba class for all abilities run by Planet Fitness UK. Contact 07958 221552 for further details. Our Lent Studies will begin on Monday afternoon, 23rd February for five weeks, Please speak to Robin if you are interested in attending. Robin is planning a Songs of Praise service on Sunday 1st March, if you have a favourite hymn or song and are willing to say a few words about why it is special to you, please fill in the insert in the weekly intimations and hand to Robin (or send a message via the Contact Page). I am the Brown Owl at the brownies and I just wanted to say a massive thank you to Grace and Peter for helping with the fundraiser, letting us in the church and doing the sound. It was amazing! I'd also like to thank members of the congregation who came along on the night - hopefully they enjoyed themselves and we look forward to seeing them again next year!! A letter of thanks has been received from the Kirkcaldy Foodbank for our donations of food, particularly over the Christmas period when supplies were at a low ebb. However, there is still a continuing need for donations, and our support is much appreciated. Zumba Gold from 10am to 11am. Tai Chi from 11.15am to 12.15pm. The Walkers next walk is on Sunday 11th January leaving from the Church at 12.45am. The clue to this walk is looking upwards! Yes, it's a hill but not a very big hill - Hill of Beath to be exact. The route will be a mixture paths and tracks, and walking poles are recommended. Welcome to anyone who would like to join us.